1. 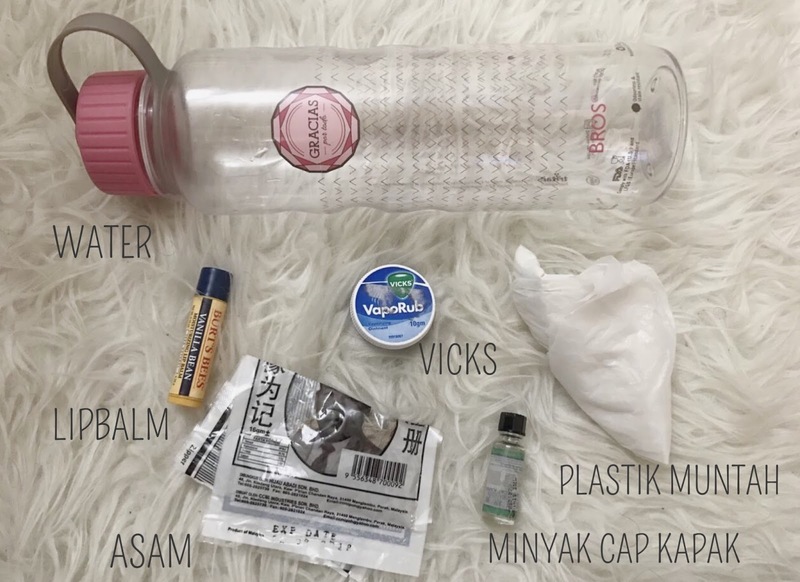 Minyak cap kapak - This is my life saver. Everyday memang sapu dekat kepala and dahi because I can't stand the smell of everything. The smell of the office, the toilet (padahal perfume toilet), and all the foods. 2. Vicks - helps with my nausea. I normally rub it under my nose to prevent other weird smells. 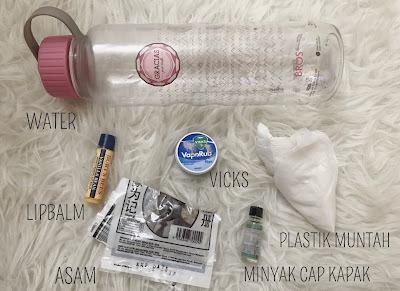 Bau vicks sepanjang hari pun takpe. 3. Plastic bag and tissues- to vomit every time after I had my meal, I'm used to the routine and just prepare plastic to puke after each meal. And always ada plastik dalam kereta. Lots of them. 4. Asam - to prevent the nausea. Always ada dalam bag. Segala jenis asam beli. 5. Baby Bump Apps. I totally love this apps because I can know how many weeks I am, the size of the baby and daily tips! 6. Body lotion - At first I bought Palmer's but I hated the smell! So I tried to avoid that by using my aloe vera gel (review here) which soothes my tummy and hopefully, can prevent stretch marks. 7. Water. For hydration since muntah banyak and tak larat makan. 8. 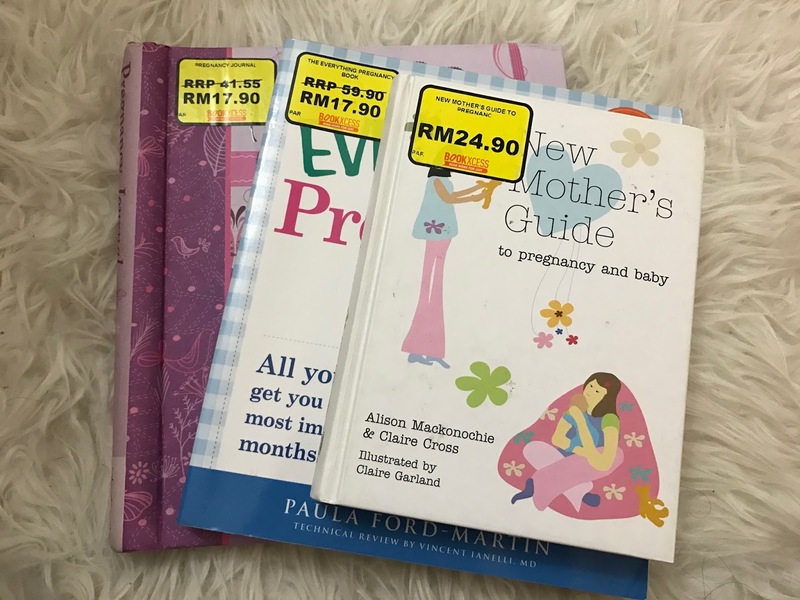 Journals and baby books - Bought at BookXcess, Fahrenheit 88. The price is so cheaaaaap! I bought these during my 7 weeks. 9. Folic Acid - I started taking folic acids since 6 weeks, although takde lah makan setiap hari. I normally take my vitamins before I sleep to prevent nausea. 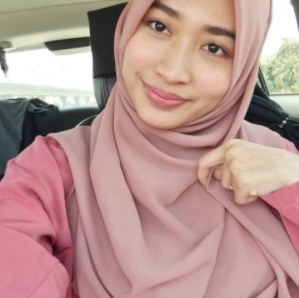 Lepas makan terus tidur. 10. Lipbalm - Burt's Bees Lip Balm. My fav. 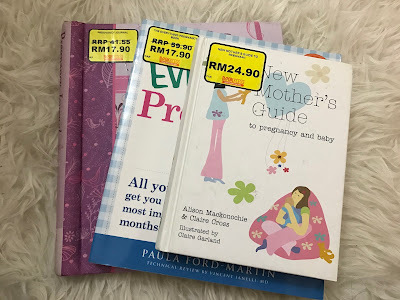 The products that I used worked for me but it may not work for you since every pregnancy is different, but hope it helps! Thanks for reading!